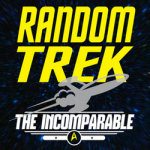 Random Trek is a podcast where Scott McNulty and a guest discuss a randomly picked episode of Star Trek. Random Trek is part of the Incomparable Radio Network. How do you pick the episodes? The process begins with the spreadsheet. Included on the spreadsheet are all the live action series (TOS, TNG, DS9, VOY, ENT) and movies (no Animated Series, sorry). Two part episodes count as one entry. When Scott invites someone onto the show he goes to Random.org and enters a number between 1 and 681. That is the episode to be discussed. Why do you hate the Animated Series? I don’t hate it, but it isn’t readily available for streaming, unlike the other 681 entries on the spreadsheet. How come there’s so much Voyager? Huh? TELL ME! Because the Universe loves Voyager? Actually, there are just a lot of Voyager episodes. The show did run for 7 seasons, so chances are pretty good that Voyager episodes will turn up often. How do I get to be a guest on the show? I’m flattered that people want to be on my little old podcast. I figured no one would want to be on, so having people express an interest without me asking is great! I know, either personally or through their work. Are referred to me by people I know. The things I look for in a guest: someone who is entertaining, has something interesting to say, and has a pretty good mic and can record their end of the conversation. Previous Star Trek knowledge is not required. Who the heck is Scott McNulty? He’s the host of the podcast and the “I” in previous answers (plus he typed these very words himself!). For more information about Scott check out his website Blankbaby or follow him on Twitter @blankbaby. Oh, so you are including the movies in this? Cool. Wrath of Khan is the best Star Trek film. I’m sure you will agree. Thanks. Wrath of Khan is one of my favorite movies of all time. Not just favorite Star Trek movies! Though, given the ratio of episodes to movies it’ll be a while before one comes up. However, when I do get a movie I think we’ll do a panel discussion. Crazy! The same goes for TNG and DS9. Guess I was a little bit bored today, so I put together an excel sheet with the calculations. Available for download. Just discovered your podcast and really enjoying it. Smart and funny analysis of the Star Trek franchise. Please keep the episodes coming! Maybe I just haven’t come across it yet, but in the original series discussion you haven’t mentioned the biggest most glaring problem with the upgrades and larger tvs: in every fight scene it is painfully clear that the guys fighting are totally different people, stunt men! really disturbing! when the originally shot them, tv were so small that the long shots could be done with the stunt guys and no one was the wiser; 50″ HD tvs and oops, a bunch of strangers fighting! also the duplicate Kirks in the same shot (enemy within, what are little girls ) also are so obviously different guys, it actually pulls you out of the stories. good work, keep it up!